Jiu is the Chinese word that refers to all alcoholic beverages. This word has often been mistranslated into English as "wine"; the meaning is closer to "alcoholic beverage" or "liquor". Unlike Western alcoholic beverages which are either fermented from fruit juices that already contain simple sugars (wine), or malted grains with sugar converted from starch using the grain's own enzymes (beer), Chinese jiu (and many other East Asian alcoholic beverages) are fermented from sugars converted from grain starch using enzymes from certain mold strains. The two main varieties of Chinese alcoholic beverages are fermented beverages (pinyin: huáng jiǔ; literally "yellow liquor"), which may be clear, beige, or reddish-brown in color; and distilled beverage (pinyin: bái jiǔ; literally "white liquor"), which are usually clear liquids. Although not a traditional product, grape wine (pinyin: pútáo jiǔ; literally "grape liquor") was first mentioned in classical Chinese poems around 2,000 years ago in the Han Dynasty. It has been increasingly produced and consumed in China since 1900 as a result of increased Western influences. Chinese alcoholic beverages are traditionally warmed before being consumed. The temperature to which the liquor may be warmed ranges between approximately 35 and 55°C, well below the boiling point of ethanol. Warming the liquor allows its aromas to be better appreciated by the drinker without losing too much alcohol. Optimal temperature for warming depends on the type of beverage as well as the preference of the drinker. The origins of the alcoholic beverage from fermented grain in China cannot be traced definitively. A legend said that Yidi, the wife of the first dynasty's king Yu (about 2100 BC) invented the method. Another legend says that liquor was invented by one Dù Kāng . At that time millet was the main grain, the so-called "yellow liquor", then rice became more popular. It was not until the 19th century that distilled drinks became more popular. 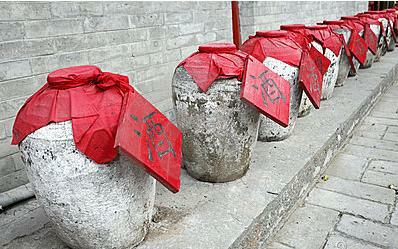 Traditionally, Chinese distilled liquors are consumed together with food rather than drunk on their own. Huangjiu were also traditionally drank warm, with the practice going back to early dynastic period. is a variety of Chinese alcoholic beverage made from wolfberry (gouqi in Chinese). There are three distinct kinds of gouqi jiu: distilled, fermented, and those produced by steeping wolfberries in another kind of baijiu. There is also a beer made from wolfberries. Gouqi jiu has a long history in China. It was recorded in Han Dynasty records. Huangjiu - A Chinese fermented rice wine, literally "yellow wine" or "yellow liquor", with colors varying from clear to brown or brownish red. Famous varieties include those produced in Shaoxing. Used for both drinking and cooking. Mijiu - a clear, sweet Chinese rice wine/liqueur made from fermented glutinous rice, drunk as a beverage, used in cooking, or served as a dessert called jiuniang or laozao in southern China. Can be considered a category of huangjiu. Chinese alcoholic beverages may occasionally be made or flavoured with fruits, but this is rather rare (it is more common in Korean wines). Medicinal herbs and spices are more commonly added to Chinese wine. These additives not only impart a reddish, brown, or green colour, but also modify the taste and flavour of the liquor itself. Some production processes also add a dark tan colour without the addition of herbs. is a full-bodied Chinese dessert wine made of 100% lychee fruit. This wine has a golden colour and rich, sweet taste. It is usually served ice cold, either straight up or on the rocks with food. Lychee wine is believed to pair better with shellfish and Asian cuisine than with heavier meat dishes. This refreshing beverage can also be used as a cocktail mixer paired with other spirits. also known as plum wine, is popular in both Japan and Korea, and is also produced in China. It is sweet and smooth. Both the Japanese and Korean varieties of plum liquor are available with whole plum fruits contained in the bottle. In China, plum wine is called meijiu.